The Court can decide a case only by considering the truth and value of the several facts alleged and proved by the parties as the facts are unknown to the Court. They must be established by evidence by the parties. Now the question that arises is which party must adduce evidence? The responsibility for adducing such evidence as will establish any fact and prove the case is called the Burden of Proof. 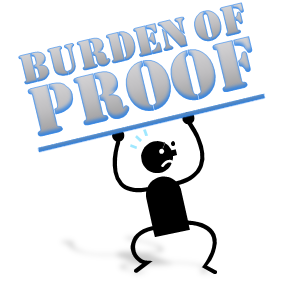 So in simple terms, the responsibility to prove a thing is called burden of proof. Section 101 of the Indian Evidence Act, 1872 defines burden of proof as, “whoever desires any Court to give judgment as to any legal right or liability dependent on the existence of facts which he asserts, must prove that those facts exist. When a person is required to prove the existence or truthfulness of a fact, he is said to have the burden of proving that fact. In a case, many facts are alleged by the parties and they need to be proved by the party alleging the fact before the court so that the court can base its judgment on such facts. The burden of proof is the obligation on a party to establish such facts in issue or relevant facts in a case to the required degree of certainty in order to prove its case. In general, every party has to prove a fact that goes in his favor or against his opponent; this obligation is nothing but burden of proof. There is difference between burden of proof and onus of proof. The ‘Burden of Proof’ is the burden to prove the main contention of party requesting the action of the court, while the ‘Onus of Proof’ is the burden to produce actual evidence. The Burden of Proof is constant and is always upon the claimant but the Onus of Proof shifts to the other party as and when one party successfully produces evidence supporting its case. The Supreme Court in the case of Addagada Raghavamma & Anr. v. Addagada Chenchamma & Anr. (1963) held that there is an essential distinction between burden of proof and onus of proof; burden of proof lies upon the person who has to prove a fact and it never shifts but the onus of proof shifts. Such a shifting of onus is a continuous process in the evaluation of evidence.